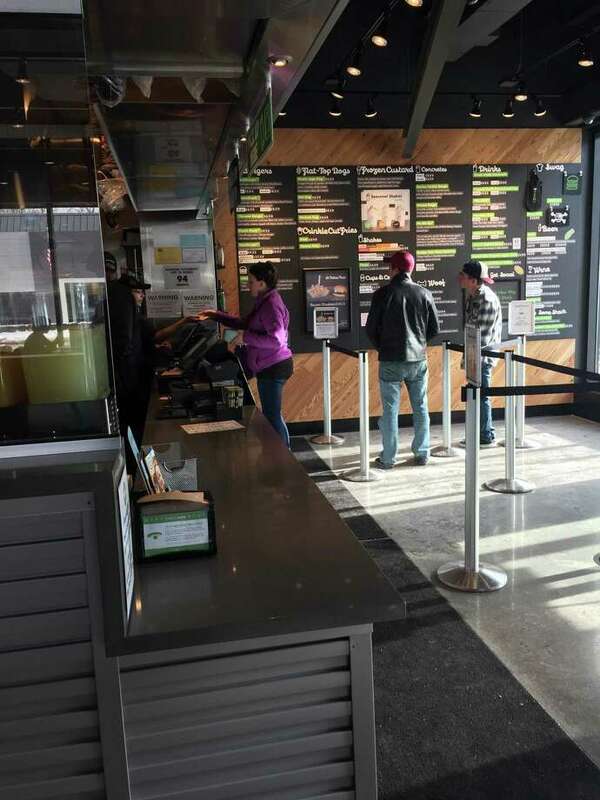 Shake Shack in Darien is open for business. DARIEN — Redevelopments, renovations and reelections defined Darien in 2017. First Selectman Jayme Stevenson was reelected for a fourth consecutive term and the town approved development projects like the Noroton Heights Shopping Center while the Darien High School was outfitted with LED lights. Shake Shack fired up its grills on January 2017 for the first time in Darien but it took some compromises to get there. The renowned fast-food burger joint had originally applied for a building permit back in March of 2016 but the Zoning Board of Appeals debated the size and quantity of the joint’s signs with potential problems for drivers. A back-and-forth between the restaurant and the Zoning Board of Appeals resulted in removing one of the three potential signs and a four-inch decrease for a road-facing sign. Construction began in mid-July and concluded in mid-December. Despite the rain and cold temperatures, over 3,000 Darien residents came out in steady turnout on Election Day. Republican incumbent First Selectman Jayme Stevenson was re-elected for a fourth term. Rob Richards, the first Democratic challenger for the town’s top office since 2011, did not obtain the necessary votes to remain on the board of selectmen. Pamela Sparkman, Democrat, replaced Richards on the board and now sits along fellow party member Marc Thorne and the three other Republican members, Kip Koons, Susan Marks and Jayme Stevenson. Joseph Warren, chairman of the housing authority, made clear his frustration at a November board of selectmen meeting because state funding hasn’t been obtained for redevelopment of the Old Town Hall Homes. And senior citizens are frustrated because they’ll have to be relocated once the project takes off. The 30 unit home complex is being redeveloped to better suit its residents with features like in-building elevators. Residents, however, are more worried about the indefinite temporary relocation and its inconveniences. Built in 1956 and with its only two renovations done in the 1970s, the Public Works Garage was in need of a facelift. The Board of Finance and Selectmen approved a bonding of $6.3 million to finance the renovation of the garage in June. Work began in late July to renovate the floors, roof and the addition of an oil and water separator are included in the project. Construction is currently underway and the project is scheduled for completion by next summer. A main traffic vein in Darien, the Boston Post Road can also be dangerous for pedestrians and children according to residents. A plan to narrow the road was axed in August by the state and police commission due to a perceived overall negative effect on traffic though residents continue advocating for safety measures. Efforts to address this problem were reactivated in September. Local officials, including Captain Donald Anderson, the Department of Public Works and First Selectman Jayme Stevenson, seek to obtain encroachment permits and additional signals and possibly traffic lights by the state. The Darien High School varsity field hockey team was the first team to play a game under the newly installed LED lights on Sept. 14. According to John Sini, chairman of the planning and zoning commission, the lights marked one of his “proudest moments” in his eight-year tenure. “This was a 22-year community effort in the making,” Sini said. The project included the efforts of the Darien Athletic Foundation and its fundraising team, the Darien Lights Brigade, and the Board of Education. The DAF successfully raised $750,000 to fund the light and sound system now active at Darien High School. A plan to add 255,000 square feet of commercial and residential space was finally approved unanimously by the Planning & Zoning Commission on Sept. 12. Federal Realty, a real estate investment trust firm, will redevelop the eastern portion of the Noroton Heights shopping center. Plans include three new buildings with 122 residential units — an effort to attract young professionals to the town — and first-floor commercial space. The project is slated to break ground this upcoming spring, according to P&Z Chairman John Sini. Citing an “accumulation of personal reasons,” Planning and Zoning Chairwoman Susan Cameron resigned in late March. Under Cameron’s leadership, the P&Z Commission reviewed large-scale projects such as the Noroton Heights redevelopment that was approved in September and will break ground in the spring. Originally appointed to the commission in 2010, Cameron served as Chairwoman from 2013 to November 2016. Prior to her role in the P&Z Commission, Cameron served in the Environmental Protection Commission.